Smaller products will have less pressure on them to sell at high prices. Heavy or bulky cheap items are almost never worth it because the margin is so small. A great example of a small well priced item is a memory card which can be packaged and sent easily, and still sold at a good price. It may seem like low priced products are the way to go, however they quickly becoming overwhelmed by overhead costs and there ends up being a very small margin. Whilst high price items can sometimes be profitable, as you have to sell less to earn the same amount of profit, generally it's a much harder sell and people are less likely to impulse buy high ticket items. This means you should be looking to sell an item in the mid priced range level - anything from around £15-70. The more expensive the item, the easier it will be to add in costs but make sure you don't overprice your items. The easiest way to do this is by using automated repricing software - set min and max limits and then let the software work out the optimum price for you to sell at to make maximum profit. Keep price-to-size ratio in mind, as mentioned above; go for smaller high priced items and not bigger low priced items - as these will already have more overhead. Finding a niche on Amazon can be quite difficult these days what with there being so much competition, but doing so will help you protect your margins. If you sell something that has limited distribution, ie it is sold by a limited number of retailers, it means you will more easily be in control of setting the price. Once other people jump on the bandwagon of your product it can easily become a race to the bottom, even worse is if Amazon start selling your product. As a massive corporation they can easily absorb the overheads to sell at a low price. If you do find yourself in this position one of the best tactics to employ is using repricing software as it will stop you from getting into a race to the bottom. Working with a brand can be hugely beneficial on Amazon. It will give you brand recognition in that people will know to come to your account when looking for a particular product. As well as this, people are much more likely to buy a branded product as it always seems more legitimate than generic products. You can also more easily create a vision and story around the brand. For this reason it works in your benefit to choose a lesser known brand. Big brands are likely to have a lot more competition and also you probably won't be able to market them in a unique way as you would with a smaller brand. When you think about searching on Amazon, you realise you only have very little opportunity to sell your product before consumers move on. Consumers have to get all the information they need from a few select pictures and descriptions. This is why it's so important to SEO your product listings, but also choose products that are easily marketable. If you can easily show and explain the benefits of your product in the limited amount of space you have to do so you're on to a winner. Think about products where it is easy for people to visualise the benefits - people will quickly catch on and it will lead to increased sales. You might find the perfect product, get excited and order some volume of it, only to find that when you've sold the product out you can no longer get any new stock. One of the most important things to check before investing in a new product is its availability. Make sure you can get a constant supply of stock for the foreseeable future and if you're third party selling make arrangements with the stockists in advance. Without taking this vital step into account anything else you have done will become useless. If your product is out of stock on Amazon, it will become less visible and your seller ratings will drop. 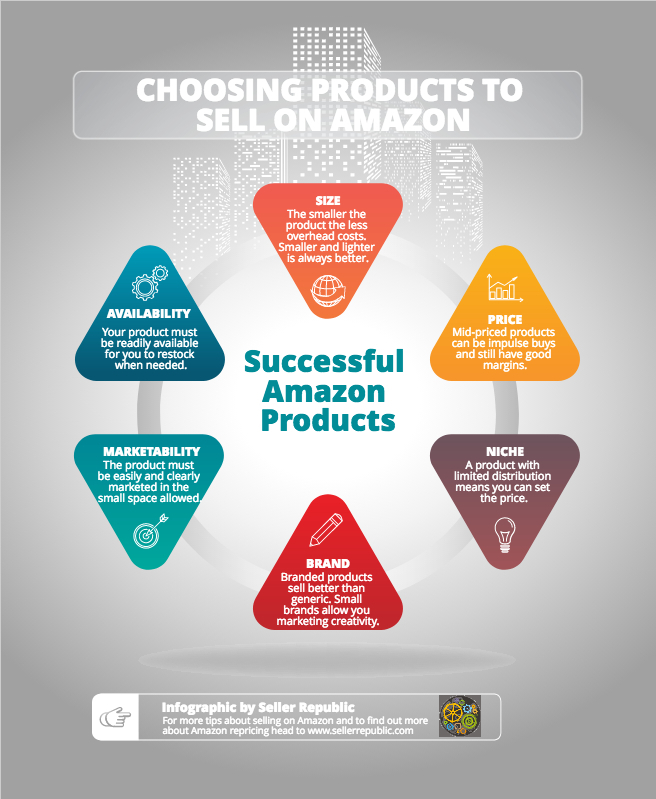 Keep these six points in mind when you're trying to find the perfect product to sell on Amazon. Remember it will probably take a lot of hard work and searching to find the perfect product but these steps will at least give you an idea of what to look out for. Putting in the time to find a good product will definitely be worth it in the long run as you will quickly find it maximizes your profits.